Arrive at every destination looking red-carpet ready inside a new INFINITI crossover or SUV. Luxury has truly never felt or looked better, so come visit our INFINITI dealership near Boulder, CO, to experience the power and elegance that only a new INFINITI can create. Whether you want to enhance your versatility with a new INFINITI QX30 or upgrade your capability with a new INFINITI QX60, you’ll be able to explore every beloved INFINITI crossover and SUV on our lot. We suggest you hurry though, as these models aren’t going unnoticed, so come find yours today. If you want a crossover with a personality as unique as your own, buy or lease the new 2018 INFINITI QX30. The 2018 QX30 comes powered by a dynamic 2.0-liter Turbocharged engine that races to 208 horsepower and 258 pound-feet of torque. You’ll never need to end your adventures early because the new INFINITI QX30 returns up to 33 highway mpg and offers available Intelligent All-Wheel Drive (AWD) for optimal performance. Plus, you and your crew will cruise in premium comfort thanks to available Genuine Nappa leather seats, and enjoy the crystal-clear audio quality of your optional Bose® 10-speaker premium audio system as you go. Meet the new 2019 INFINITI QX50. The 2019 QX50 is here and it’s leading the way with a potent 268-horsepower 2.0-liter VC-Turbo engine that’s been perfected over the course of 20 years. This new INFINITI SUV was designed entirely around your needs and features tailored leather-stitched seating to give your drives a touch of class. You can configure your 2019 QX50 interior to create up to 65.1 cubic feet of cargo space, and load your luggage easily with a standard motion activated lift gate. INFINITI ProPILOT Assist comes standard on the 2019 INFINITI QX50, granting you access to advanced safety technologies such as Forward Emergency Braking with Pedestrian Detection. 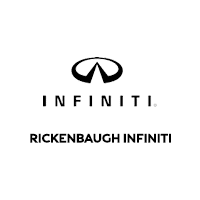 Schedule an INFINITI test-drive and visit Rickenbaugh INFINITI to lease or finance a 2019 QX50. If you love the 2018 INFINITI QX30 but wish for stronger performance, you’ll find your match in the new 2018 INFINITI QX60. The 2018 QX60 runs off a more powerful 3.5-liter V6 engine that produces 295 horsepower and 270 pound-feet of torque. It also enhances your handling capabilities with an INFINITI Drive Mode Selector with Standard, Sport, Snow and Eco modes. Inside its cabin, you’ll enjoy a host of available entertainment features such as an INFINITI InTouch™ system with HD Radio™, a Bose® Cabin Surround® 15-speaker sound system with digital 5.1-channel decoding and more. So, don’t hesitate to take advantage of your optional heated second-row seats because you’ll be well protected from safety systems like an optional Around View® Monitor with Moving Object Detection. For those who wish to feel their pulse quicken the instant the accelerator hits the floor, the 2017 INFINITI QX80 is perfect for you. This new INFINITI features the strongest and fastest powertrain out of the INFINITI crossover and SUV lineup, boasting a daunting 5.6-liter V8 engine that races to 400 horsepower and 413 pound-feet of torque in a flash. This INFINITI SUV also comes ready to dominate adverse terrain with its Snow and Tow modes to help ensure every family vacation is a great one. Plus, with standard leather-appointed seating, heated front seats, heated steering wheel and power 60/40-split fold-flat and reclining third-row seats, you’ll be able to spend quality time with the family while relaxed in pure luxury. Add that to standard Bluetooth® wireless technology, SiriusXM® Satellite Radio and Brake Assist features, and you’ll find every road trip should begin and end with the 2017 QX80.